Who knew that a German mixed martial arts event would be so relevant for Conor McGregor fans? Firstly, you had Maurice Adorf take to the cage and remind everyone of 'The Notorious' with his McGregor-esque look and movement in his victory over Ridvan Nuka. Adorf earned more mainstream attention than he would have expected in his second bout as a professional because he bore an uncanny resemblance to the former UFC featherweight and lightweight champion. 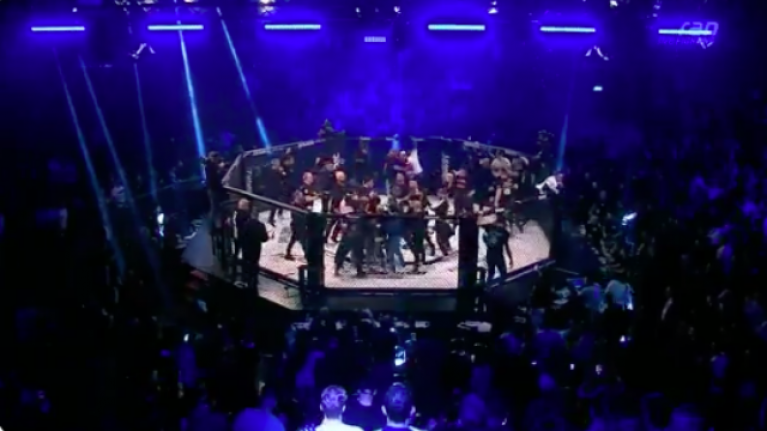 Elsewhere on the card, it was impossible to ignore any references to UFC 229 when all hell broke loose inside the cage in the GMC 18 main event after the referee in charge of Ömer Solmaz vs. Felix Schifffarth failed to see the towel that had been thrown in by Schiffarth's corner. Schiffarth had clearly endured enough punishment and his coaches attempted to rescue him but the towel landed on the fighter's calf while he received a brutal beating from back mount. Because the towel was not acknowledged, Schiffarth's team took matters into their own hands and jumped over the fence to save their fighter from unnecessary damage just as the official pulled Solmaz off him. The arrival of Schiffarth's teammates sparked a full-on melee as Solmaz's corner rushed in before several friends and family followed suit. At one point there was close to thirty people in the cage as security attempted to restore order. To be fair to Solmaz, he did nothing wrong as he would have been instructed to continue fighting until the referee ends the fight.